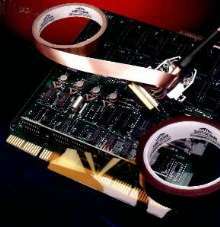 Masking Tapes suit pcb assembly and powder coating. Commercial Grade CHRÂ® K-201 and K-202 pressure sensitive tapes feature polyimide film combined with no-residue, fully cross-linked silicone adhesive. They offer resistance to chemicals, abrasion, contamination, and high temperature. Silicone adhesive operates effectively between -100 to +500Â°F, making tape suitable for most process environments. Tapes are available in 39 in. x 36 yard master logs or in cut rolls in widths from Â¼-39 in. x 36 yards. CHR® Brand K-201 and K-202 Polyimide Film, silicone adhesive pressure sensitive tapes, offer exceptional performance at the right price for fine line masking in competitive PCB finger masking applications as well as in demanding appliance powder coating applications. Featuring a durable, excellent quality, low cost polyimide film combined with a no-residue, fully cross linked silicone adhesive, these non-UL high temperature tapes broaden CHR's K-Series product line. K-201 with its 1 mil film substrate and K-202 with its 2 mil backing provide flexible, durable resistance to chemicals, abrasion, contamination and high temperature to produce the desired results. It's silicone adhesive operates effectively between -100°F to +500°F, suitable for almost every process environment. Available in master logs (39" x 36 yards), or in cut rolls (widths from 1/4" to 39" x 36 yards) expeditiously from our huge inventory in Hoosick Falls, NY. For more information call toll free 1-800-962-2666 or fax 1-800-526-8479 and speak to our Customer Service Representatives. 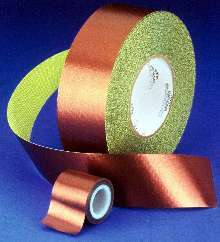 Copper Tape suits heat sealing units in packaging equipment.